The TUF SHINE Tire Brush is a great tool for deep cleaning your tires. It’s a very durable tool that will help you get your tires looking their best. Spray the TUF SHINE Tire Cleaner or your favorite degreaser on the tires and then agitate them thoroughly with this brush. The bristles are strong yet gentle so it does a great job of removing build ups without scuffing the tires. Deep cleaning the tires with this Tire Brush is critical before applying any tire dressing and especially the TUF SHINE Tire Clearcoat. The Tuf Shine Tire brush is by far my favorite brush to clean tires with. Its super durable and can withstand the abuse I give it. Using it in conjunction with the Tuf Shine Tire Cleaner it makes for an amazingly clean tire. One downfall I found is that unless cleaned properly the effectiveness of the brush fall off quickly. After a car that has been recently dressed with a silicone based tire dressing the dressing will adhere to the bristles making the brush less than effective at cleaning off other tire. Although the Tuf Shine Tire cleaner cleans the tires, spraying it on the brush will not remove the dressing. 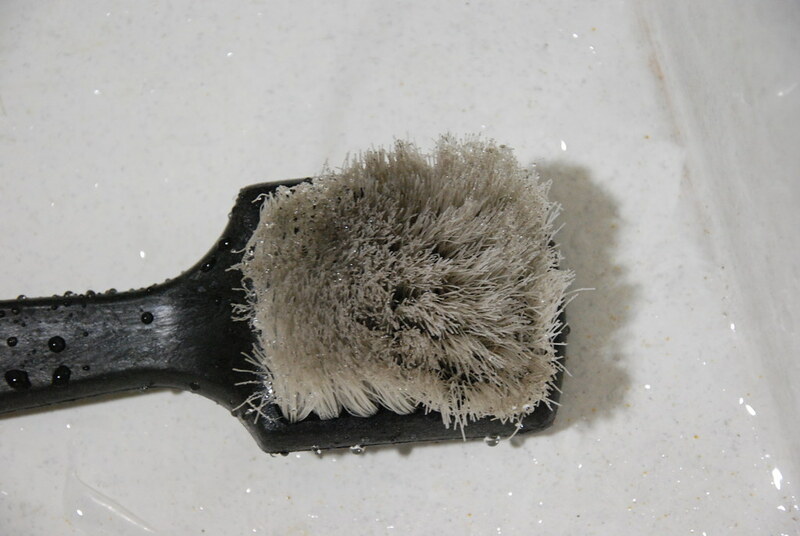 A simple trick to bring back your Tuf Shine Tire Brush is to spray it down with Tarminator and then rinse it off. Rinse it quite a few times, you don’t want tarminator residue left on the bristles. If the brush has really caked on dressing then you may have to do this more than once, while not perfect, this will allow for like new effectiveness of the brush. I use spray 9 to clean my tire brush. 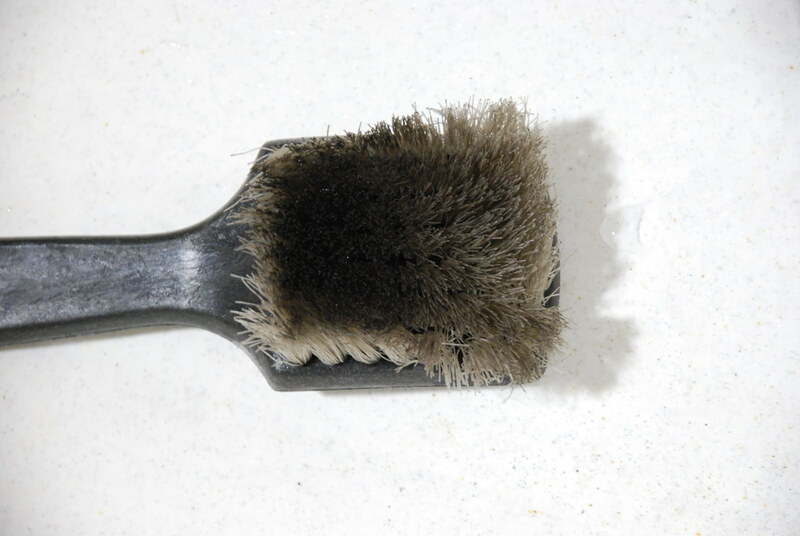 I LOVE THIS LITTLE BRUSH….I LET THE BRISTLES SIT IN MINERAL SPIRITS AND RINSE.LOOKS LIKE NEW!